Hettich Full Access QUADRO FAQ Silent System Full-Access Slides for face frame application. You'll hardly hear a Quadro and you won't see it at all, Silent System closes all drawers gently and softly making them a particularly good choice for high-quality cabinets and furniture. NOTE: These slides are NOT meant for retrofit applications. Drawers must built to accommodate slides as detailed in product specs. Fit the same drawer size and can be a "drop-in" replacement for the Blum Tandem Slides. Note: This product is also known as HET-9-133-304, 9133304, HET-9-133-305, 9133305 on other websites. Load capacity: 75 lbs dynamic. Mounting: Concealed, undermount; For face frame applications. 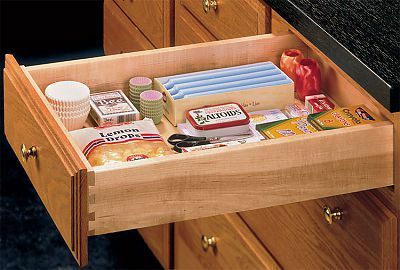 Features: Full-access runner for wooden drawers. Perfect vertical and lateral stability & Soft closure with self close - the spring-operated mechanism closes the drawer safely and automatically. Robust, resilient tracks to ensure optimal runner action through precision-guided steel balls. Slide-on assembly - simply place the drawer on the runners and push in for connection. For 16 mm [5/8"] and 12mm [1/2"] drawer panel thickness (spacers required for 1/2" material). Silent System: the dampening device integrated in Quadro FAQ - closes the drawer softly and soundlessly.